This year has certainly flown by and now it's just merely days until the new year. It's been a good year and I am excited to see what the New Year brings. I can't wait to have a festive celebration with friends and family. Since Hubs doesn't drink alcohol anymore and I am the lightest of lightweights, a refreshing spritzer is my drink of choice. When I was giving birth to both of the kids, the hospital had the most amazing spritzer that I buzzed for constantly. I wanted to recreate that with a festive twist for the New Year celebration. 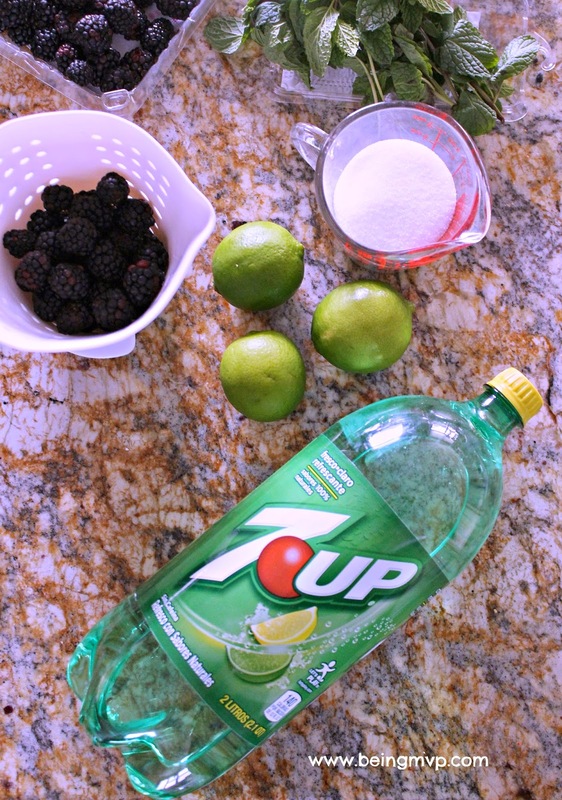 Mason loves blackberries and I am a huge lime and mint fan so a Blackberry Mint Spritzer makes for a beautiful combination of flavors. It's the right amount of bubbly to cheer with and kid-friendly for my kids to enjoy as well. 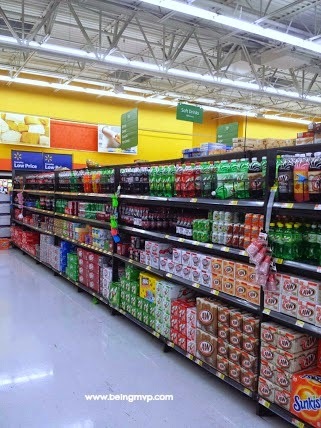 I picked up a few 2L bottles of original 7UP® as well as the remaining ingredients at Walmart. 1. 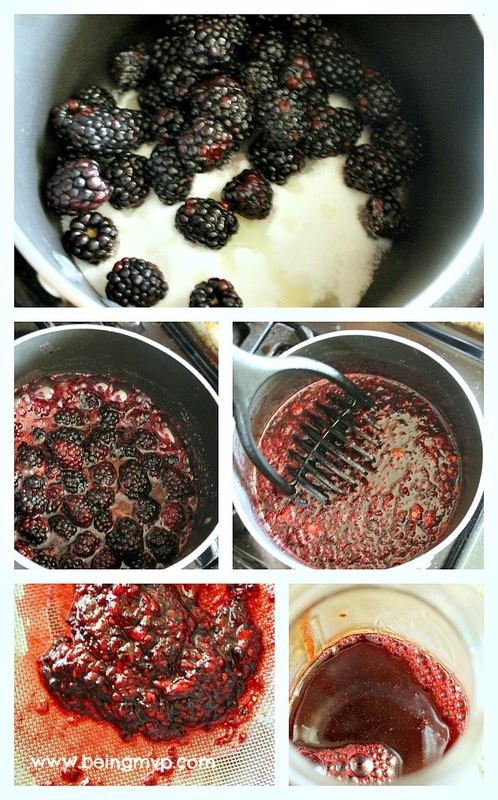 In a small pot, bring blackberries, lime juice and sugar to a boil over medium-high heat. 2. Remove from heat and mash the berries. 3. Pour through a sieve into a large cup or bowl. 4. Refrigerate until cold (about 30 minutes). 5. 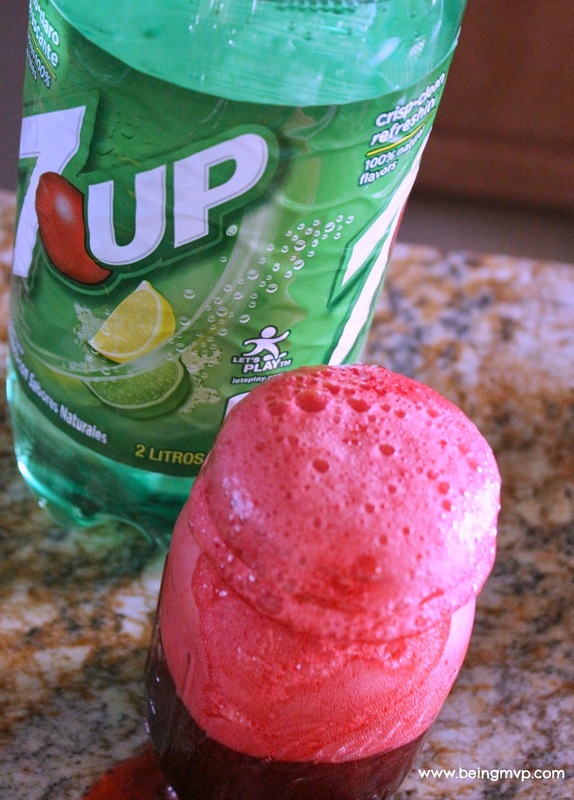 Add 7UP® and pour over ice. 6. 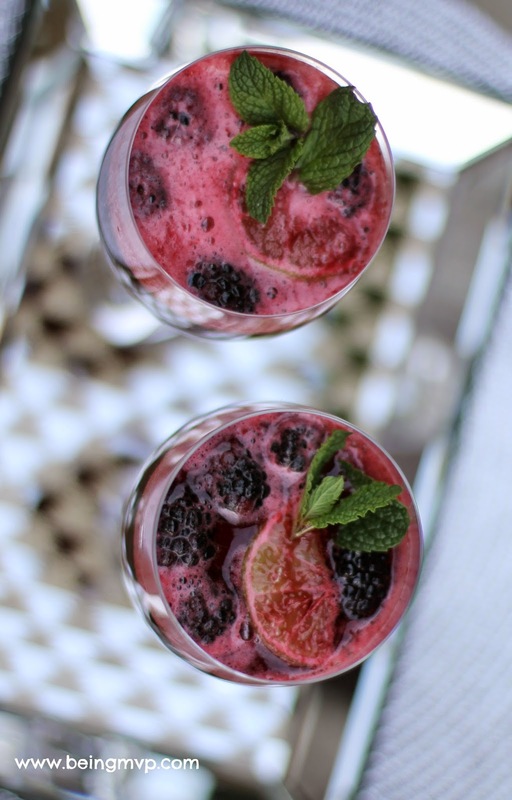 Garnish with blackberries, lime slices and mint leaves. 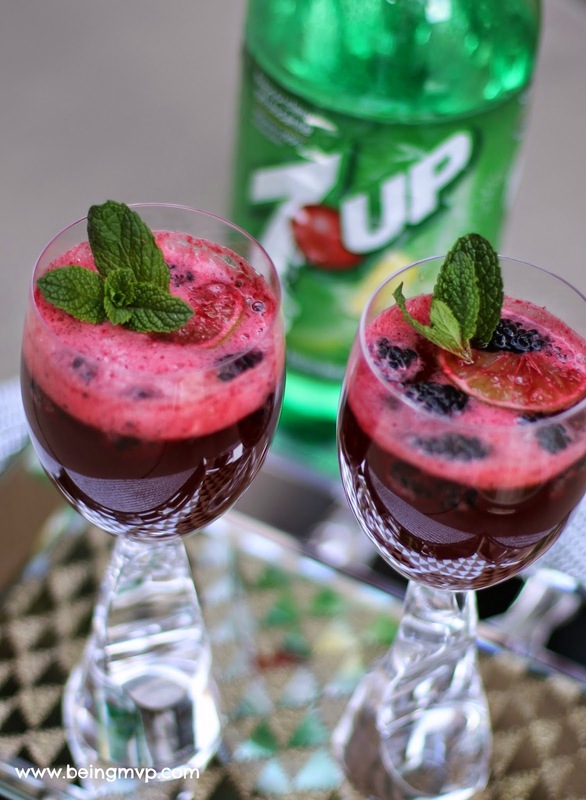 The clean, crisp taste of 7UP® with the sweetness of the berries makes this bubbly spritzer a favorite to toast with when the countdown begins. What are your favorite drinks to ring in the new year with? Those sound delicious. Perfect for me to serve to my guests on New Year's eve. I love that they are non-alcholoic. Its hard to find a good "Mocktail" recipe! What an interesting flavor combination! I would love to try these. Now that is an awesome drink I coudl definitely enjoy to ring in the new year! Love it! And I love that it is family friendly too! my kids would love it too! I bet this has the perfect balance of sweet and tart, and I love the addition of real fruit. I am always looking for new mocktails so I will have to add this to the rotation, thanks! Yay for more Mocktails! These look really refreshing too. Looks like a delicious drink! My kids would love something like this for New Years, sounds like a perfect treat. I prefer spritzers as well. Blackberry mint sounds delicious! These sound amazing!! I have never tried the blackberry mint combination. 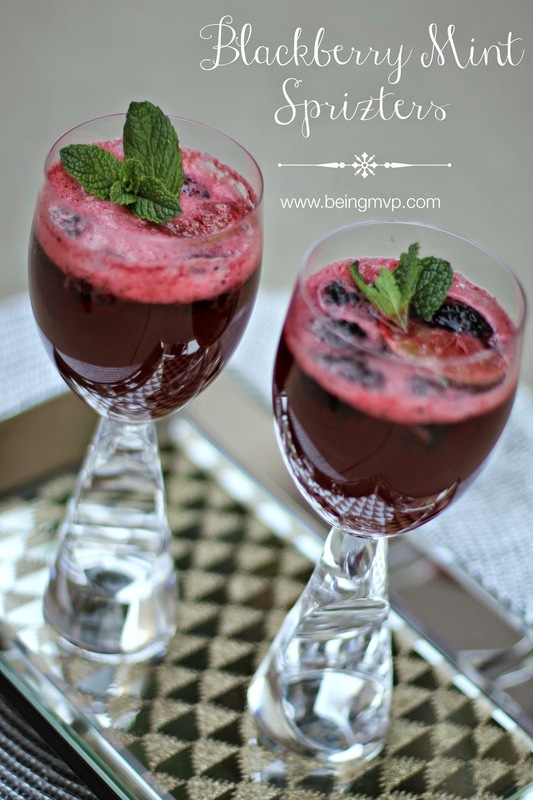 Oh my those Blackberry Mint Spritzers look delicious! I bet my family would have loved a few of these fruity drinks for Christmas. This looks totally refreshing and yum! I'll have to make this drink, and soon! Yum, this looks amazing! I may give this a try, I usually just have some sparkling cider on New Year's. This looks good and sounds like an excellent alternative forr adults who are designated drivers or dont choose to drink. I also like it because it is also kid friendly. Oh my word... these look amazing, and sound like they taste amazing too. I'm currently nursing so it's nice to have a yummy non-alcoholic alternative. Thanks so much for sharing! Those look delicious! I love blackberries. I'm glad I found your spritzer recipe before New Year's Eve. Guess what I'll be serving :) It looks soooo good! I don't drink alcohol so I really like mocktails. Thanks for sharing the recipe! Your drink is gorgeous and looks so delicious! I love the recipe and think it would be a good one to make for the New Year! Thanks for sharing. I will have to try this recipe. Wow! Your presentation is so beautiful I don't know if I could drink it. Those glasses are spectacular! But the drink sounds awesome too! I'd love to make those in the summer too. Wow!! This looks and sounds AMAZING!!! Im such a sucker for a drink with mint in it!! Love fresh and muddled mint!! Will have to try this! !